Small, difficult parts being machined out of a thin aluminium sheet. 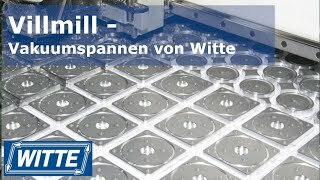 If a process involves cutting many small parts from one large sheetmetal plate Vacuum & Vilmill are the duo for the job. Witte Bleckede, supplier of a comprehensive variety of vacuum equipment, has added „Vilmill“ to their range of supply. This fleece-like foil has a special adhesive coating. Its unique advantage become apparent when used together with correspondingly designed and developed vacuum chucks and appropriate high-suction pump system for high speed cutting (HSC). Vilmill foil is used as a layer between vacuum chuck and part. The warmth created during high-speed machining activates the special surface coating on the foil, thereby embedding and additionally securing the part. Under-pressure created by the vacuum pump pulls through the slightly porous Vilmill foil primarily ensuring optimum chuck efficiency but at the same time the foil acts as a puffer for the part. The adhesion effect provides additional security, especially when machining small parts. Removal of the parts is made easy as they remain “stuck” in position on the whole Vilmill foil. As with all vacuum applications suitable machine parameters and proven processes, i.e. leaving as much closed surface under vacuum as possible until the last cut, should be adhered to. Vilmill is suitable for dry machining (min. 20.000 RPM) of aluminium plastic sheets up to a thickness of 15mm and is available together with vacuum equipment from Witte.